A southbound picture of Grense Jakobselv village; the left side of the river belongs to Russia and the right side to Norway. Grense Jakobselv (Northern Sami: Vuorjánjohka Finnish: Vuoremijoki and Russian: Гренсе Якобсэльв) is a small village in Sør-Varanger Municipality in Finnmark county, Norway. It is located on the shore of the Barents Sea at the mouth of the Jakobselva river. 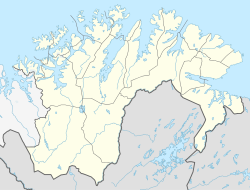 It lies about 54 kilometres (34 mi) by road east of the town of Kirkenes. The area was settled by Norwegians in 1851. The Jakobselva river forms the border with Russia, on the east side of Grense Jakobselv. Here, there is a small post of the Garrison of Sør-Varanger of the Norwegian Army, from where soldiers patrol the border. In this area, however, there is no public border crossing. In the village, there is a stone chapel built in 1869 called King Oscar II Chapel. The church was built to reinforce Norway's territorial claim to the area, and was named after King Oscar II of Sweden and Norway at a visit he made in 1873. Grense Jakobselv is the point in mainland Norway farthest by road from Norway's capital Oslo. It is 2,465 kilometres (1,532 mi) by a route entirely within Norway [Oslo Central Station -> E18 (2 km) -> Rv190 (5.5 km) -> E6 (121 km) -> Rv3 (272 km) -> E6 (1501 km) -> Rv93 (97 km) -> Rv92 (97 km) -> E6 (316 km) -> E105 (9.5 km) -> Rv886 (44 km)]. 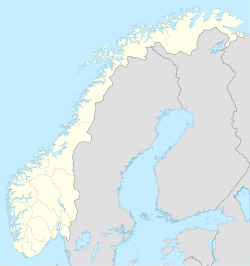 It is about 1,955 kilometres (1,215 mi) (510 kilometres (320 mi) shorter) via a route through the neighboring countries of Sweden and Finland. It is not the farthest place using international routes, that would be Gamvik, 2,040 kilometres (1,270 mi). ^ "Grense Jakobselv" (in Norwegian). yr.no. Retrieved 2013-03-14. ^ Store norske leksikon. "Grense-Jakobselv" (in Norwegian). Retrieved 2013-03-14. This page was last edited on 12 May 2018, at 21:15 (UTC).